A new type of bike lane design for San Francisco, and perhaps the whole country, is coming to a four-block stretch of Bay Street in the Marina next fall. The street is set to be redesigned with a road diet [PDF] that includes a parking-protected bike lane on one side of the street, with a novel touch — back-in angled parking. The project will run between Fillmore and Laguna, alongside Marina Middle School and the Moscone Park. It will be the first parking-protected bike lane installed on a typical city street in SF, the only other one being on John F. Kennedy Drive in Golden Gate Park. While that project included a bike lane placed between the pedestrian walkway and parallel parking spots, the new Bay bike lane will be combined with a back-in angled parking arrangement. Currently, that stretch of Bay sees rampant speeding. It has four traffic lanes despite drawing far less car traffic than the rest of the street east of Laguna, where most drivers turn off towards Marina Boulevard and the Golden Gate Bridge. The redesign will remove two of the four traffic lanes west of Laguna, and result in a net addition of one parking space. The parking-protected portion will include a five-foot buffer between parking spaces and the bike lane. On the other side of Bay, the existing unprotected westbound bike lane will remain alongside parked cars, with a new, painted four-foot buffer to separate it from moving cars. Wherever angled parking is installed in the city, the SFMTA says it has recently been using the back-in arrangement since it helps drivers pull out of the parking spots safely while removing the danger of the door zone for people on bikes. In recent street redesigns, the SFMTA has typically converted parallel parking to angled parking as a way to make up for spots removed for walking, biking, and transit improvements, even though it eats up more street width. The parallel parking lane on the north side of Bay will be nine feet wide, while the angled parking lane will be 19 feet wide. Jose said angled parking-protected bike lanes could be expanded depending “on how effective this design proves to be on Bay Street with regards to calming vehicle speeds, enhancing safety for those walking and riding a bike,” and improved visibility for drivers using the parking spots. Other projects have been installed with bike lanes between back-in angled parking lanes and moving motor traffic. The bike lane will run alongside a block with almost no driveways. Since driveways can complicate parking-protected designs and SF is littered with private garage entrances, similar streets could be difficult to find. The Bay redesign has already been approved by the SFMTA Board of Directors will be implemented after a road re-paving and sewer work planned for next summer by the Department of Public Works, according to DPW spokesperson Alex Murillo. It would be installed anywhere from late fall to the end of the year, he said. I remain skeptical of this design. Why SFMTA must you insist on paint where a curb is needed? With this design cyclists will need to dodge the tail end of some F-350 sticking into the bike lane. Just as is the case with the JFK cycle-track, certain drivers willfully park well into the buffer, sometimes taking the whole buffer. On JFK this maintains dooring as an issue. Drivers of long vehicles sure as heck won’t be leaving their nose in the roadway. For many other drivers basic competence is an issue – without a curb, they have no idea where to stop. Has a single ticket ever been issued for parking in a painted buffer in this town? 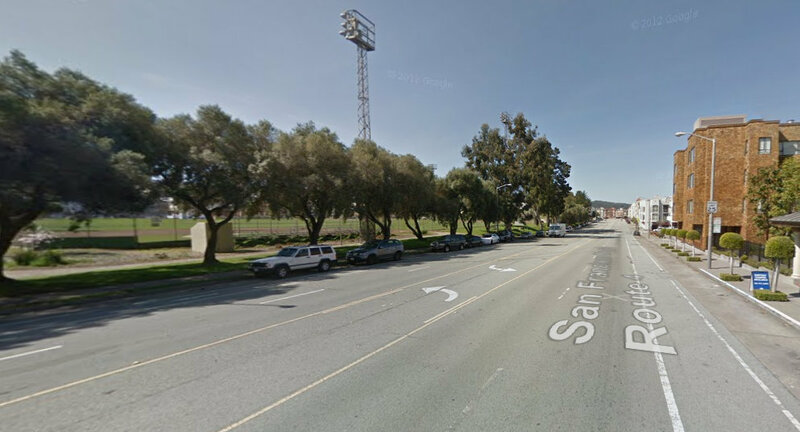 The intersection of Fillmore at Bay needs to be revisited – that the bike lane doesn’t go to the intersection is a problem – as is the free right turn from Fillmore. This would be greatly improved with a pedestrian bulb-out on both sides, loosing the free right turn island and straightening the median island. Nice, but there needs to be a right-turn transition zone westbound at Buchanan. I can’t tell you how many times I’ve nearly been right-hooked by drivers on their way to the Marina Safeway. I love the back-in angled parking protected bike lane concept, that is a brilliant combination. The eastbound intersection with Laguna Street looks kind of sketchy though. That appears to be a really wide right turn lane, so why not narrow it down and then wedge a bike lane between it and the straight through lane? That way bikes don’t have to swing way over to the left quite so much to proceed straight through. The bike lane could then be striped all the way from the buffered area to the intersection, with an obvious merge area for right turning cars to cross over while watching for bikes popping from out behind the parked cars. Bikes will use the pedestrian crosswalks to turn? Bikes almost never proceed straight through, since the bike route jogs one block over to Francisco east of Laguna. I’m not sure why a sharrow is even shown there. This stretch is perfect for a pilot like this. My son goes to Marina Middle, so I bike it often and have just as often wondered why there is this canyon of a road sitting there empty (apart from the Nascar wannabes). If this works, how about doing the same for Townsend near Caltrain where there is back-in parking…then the same for Brannan near Embarcadero…then for Eighth…then for…. I agree with the sentiment, but believe it won’t simply be paint, but parking curblets to prevent F-350 a$$-encroaching onto the buffer. Sorry for the serial posting, but just noticed the reference to driveways and parking-protected bike lanes being incompatible. Is there research that shows such streets are more dangerous than ones where the bicyclists are made to ride next to moving traffic and generally near the door-zones of parked vehicles? I sometimes think this is just groupthink, but am interested if there is data. In my personal groupthink, every moving vehicle and every driver-side door represent a highly likely “conflict point,” while seldom-used driveways and seldom-used passenger doors present a far less likely danger to the bicycle rider. Am I alone in thinking this? Again, happy to learn about data to support/debunk either point of view. If there is a bike lane and a buffer, I’d rather have the buffer between the bike lane and the parked cars. Agreed. I live on Bay near Webster, and cars constantly blow the stop sign at Bay & Webster without even trying to stop. It’s totally inappropriate given that there’s a school, a park, a rec center, and a library on that block, and there are always people walking with their families or with their dogs who use that cross walk. Re: driveways being an issue. I could see it being a problem if somebody is riding in the bike lane when somebody wants to pull into their driveway — the parked cars would obscure the cyclist. I wouldn’t feel comfortable biking in this scenario. This is purely anecdotal, though — no idea if data is available. Do you think metered parking would be a good idea along the park? I see lots of people playing softball at night and on the weekends. I wonder if it could be beneficial to have a few metered spaces (like 15-ish) so that people who want to use the park can park closer and not have to lug their gear, plus it would cut down on circling for spots. It feels like the “suicide” lane is a bit of a waste on this street. The biking connections to the surrounding streets definitely aren’t ideal in any way, but imagine a complete street with simply two lanes of traffic, back in parking on one side, parallel parking on the other… Then a planted median behind the back in parking, and a two way cycletrack of sorts between the median and the sidewalk. There just is way too much asphalt out there right now, no matter how you stripe it! Permeable paving would be nice, but the fact is we’re just converting a a raceway into a parking lot. Neither is ideal. Again I really dont think the suicide lane has very much benefit and may actually create more confusion with people diving straight into the back-in parking. But also, you will see people zipping around cars that are either waiting for parking, double parking, or trying to park. All of which are hazardous conditions! I think there would be neighborhood support for evening metered spots around sports fields. After all, the neighbors aren’t driving to play there, and I can tell from my experience that when there is an organized team sport in Joe DiMaggio, near where we live, parking is pretty tough while the lights are on. Was excited to hear about this when they first approved it! Just curious, will adding parking on Bay finally placate the residents on Chestnut opposing parking removal for lengthened bus zones so 60′ buses can operate? [ TravelLane | Parking | Buffer | Bikes ] ? Is the 4-foot buffer not wide enough? If every house on a block has a garage and driveway, then there won’t be very much street parking to “protect” cyclists anyway. I assume that is why this design requires the good fortune to not have many driveways on a block. Driveways may be “seldom-used” but it’s possible that drivers entering and leaving them may pay less attention when doing so precisely because they know there cannot be any crossing heavy vehicular traffic. However, at least they will not be moving very fast. One problem I have seen with bike lanes on the right of the parked cars is that pedestrians then treat it as an extension of the sidewalk. And in particular, wheelchairs, skateboarders, strollers, folks with shopping carts and basically any “pedestrian with wheels” considers the bike lane fair game. Visibility. Drivers would never be able to see bikes behind a row of parked cars, and right-hook collisions would be rampant. thank you Bruce. I suppose that could be mitigated by eliminating parking near intersections and driveways but that would be a lot of parking loss. I fully agree that bike lanes should be protected whenever possible – especially along Townsend. As a cyclist, one must be constantly vigilant for inattentive motorists, especially when passing dozens of parked cars. With back-in angled parking, such cars can quickly pull into the street (easily colliding with a bicyclist in the process). Along Townsend, there is not much pedestrian traffic on the south side and there are very few driveways – it’s a perfect spot for an angled parking protected bike lane. Glad to see that the SFMTA is finally going to try this out (on Bay Street). They could keep the parking (maybe even increase it a little) by removing half the stops on Chestnut, so that the 30/30X stop every other block, like the 41/45 do on Union, and extending the remaining bus zones to accommodate articulated buses. There’s absolutely no reason why those buses need to stop every single block on a very flat street where the blocks are fairly short. 1. Right hook by drivers heading to the Safeway. 2. T-bone by cars on Buchanan trying to turn left on to Bay, and not stopping at the limit line b/c they have poor visibility. 3. For pedestrians, it’s dangerous to walk across Buchanan at Bay because of cars not stopping at the limit line (when turning left or right, b/c of poor visibility). 4. On weekends, Goodwill parks their trailer on Bay so cyclists have to move into traffic to pass the trailer. I really hope that the new street design will remove a couple of parking spaces on the north side of Bay so that there’s better visibility. Pedestrian bulb-outs would be nice too. That intersection is a perfect example of how poor design endangers everyone. That’s such an infuriating reason. Why isn’t this a concern for DC’s Class I lanes? Why isn’t it a concern for Dutch designs? This sort of design makes my blood boil. Plus, a few of the stops are in front of driveways and wouldn’t be replaced with anything if they were to be removed. I fear for the safety of people who may not be paying attention to me on JFK. When I ride at night, with my lights on, I have so many close calls with pedestrians crossing the bike lane or sticking their strollers or kids in to the bike lane. The lighting is not very good, and people going to their cars seem to think the bike lane and buffer are extensions of their parking spot. Then put the park back in parklet and just have benches and stuff for the public and maintained like any other park. However, back-in angled parking allows a much better view of the road before pulling away. Normal head-in angled parking means that the view is much more limited, especially when a something like Suburban has decided to park next to a Miata. The driver backing out typically cannot see until they’re almost in the lane. With back-in, not only is the big box at the rear of the SUV not in the way of the view, but hoods are generally lower and easier to see over too. This design offers a chance to not just make a PBL, but to do another useful addition: allow bicyclists to bypass an unnecessary stop light. Assuming that they’re stop sign/light controlled, here’s no reason why the eastbound cycletrack needs to stop at all at the intersections in the middle. The only potential conflicts are with pedestrians, but people are generally able to figure that whole thing out on their own without signs and lights.